This fine young fellow is experiencing the Trolley Problem. His father has asked him to decide which way the train should go. One path kills one toy person, the other kills five. He simply moves the one toy person to the track full of toy people and with much delight pushes the train over all of them. 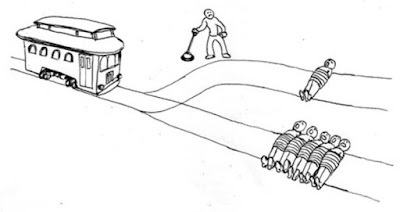 The Trolley Problem is an example of a thought experiment in ethics. The problem asks you to decide which is most ethical – allowing five people to die or causing the death of one in order to save the others. As is typically true of thought experiments there is no correct answer. One such dilemma is abortion. Abortion is an easy choice when we think we are granting freedom. It is an easy choice when we feel we are champions of human rights. It seems so right to allow someone choice over life decisions when we only consider the life of one person. But abortion is not about the life of one person. It is its own trolley problem. Do we end the life of one baby in order to preserve the quality of life of one woman and possibly her family? I suspect that abortion is rarely a thoughtless decision. It costs money, it may have health repercussions, it changes a woman’s life much as a pregnancy does. Yet, it is only possible if we forget the second life on the other decision track. For many women who undergo an abortion, to not do this procedure would create much hardship. Some women feel they cannot afford a child, some do not want to make this life change, some do not feel they can be a mother to a child with a disability, some women are battling an illness that may take their life if their pregnancy continues. Abortion is not an easy problem. It only becomes an easy solution when we forget the life of the child. This is the ethical dilemma of our times. How can we call ourselves tolerant when our tolerance only extends to those who live outside the womb? How can we call ourselves ethical when we make it legal to kill those who cannot cry out for help? How can we call ourselves human when we care nothing for the lives of these infants? We have simply erased the ethical problem by erasing the existence of the life. We have decided that life begins when a woman decides she wants the baby. Life does not begin at conception, it does not begin at birth. It begins with the decision of a mother to want, to be happy, to accept. There is no science found here. This makes no sense. It is a thought experiment that is resolved by making the decision to not think, to not consider, to not care. This ignoring of a life does not seem to stop with the unborn child. Once we can make the decision to allow this death it becomes easy to encourage others to die. Those who have lives we do not wish to have should want to die. We do not have to decide for them to die; we do not have to do the killing. We will just let them realize their life is not valued and then they will want to die. We might work hard to stop some suicides, but look the other way for the self-induced death of those whose lives we no longer value. Death becomes a friend, or at least a solution, instead of the enemy we know it to be. When we think we can solve world problems we create more trouble than we can know or understand. We think we are intelligent. We think we are sophisticated. We think we can create a better world through philosophy, industry, or perhaps technology. We think this, but we are wrong. We are the same as the toddler in the first clip. He does not yet have the mental capacity to see the problem his father has created with his toys. He does not know about death; he knows only about play. The symbolism is lost on him. There is so much more that is lost on us! As advanced as we humans imagine ourselves to be, there is more about the world that we do not understand than there is information found archived on the internet. We cannot know God’s plan for our daily lives. We can only see His plan for our Salvation. We cannot know God. We can only experience His love for us. Through the power of that love we can read and study His Word, worship His holy name, and joyfully receive forgiveness and faith through the sacraments. We can rejoice in the sacredness of being God’s child.